Q. I was sent to hospital by SCDF ambulance. Will I be charge for the ambulance service? Q. What are the SCDF Ambulance Charges? A. The SCDF does not charge for any emergency case it conveys to hospitals. However SCDF charges $274 for each non-emergency case that it ferries to hospital. Note: The final outcome of the emergency / non-emergency status of a patient will be based on the assessment of the doctor at the Emergency Department of the receiving hospital. Q. 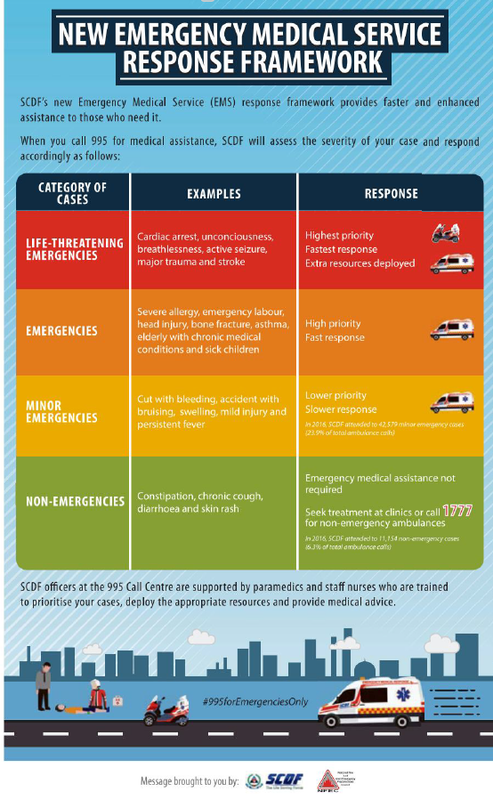 Can I call 995 for SCDF ambulance if my case is not an emergency? A. SCDF ambulances only respond to medical emergencies. The public is advised not to call 995 for non-emergencies as this will stretch its resources and affect its fast response to emergency incidents which can cause the difference between life and death. The hotline for non-emergency ambulance is 1777. Non-emergency ambulances are run by private operators. The charges are shown at the Ambulance Service Webpage. This entry was posted on November 21, 2017 at 1:51 pm and is filed under Health. You can follow any responses to this entry through the RSS 2.0 feed. You can leave a response, or trackback from your own site.